Keeping up with Landree: Blog Award! Jamie loves my blog. She told me so and she gave me this. Isn't that sweet? I met Jamie when I did a blog makeover for her a few months ago. She's a teacher and she's pregnant! Congrats Jamie! 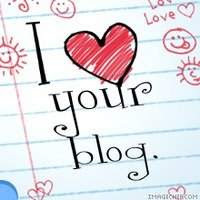 I heart your blog too! 5. Leave a message on the blogs that you've nominated! 1. The Pixel Fairy Princess: Debbie is the most talented photographer! I want to take pictures like her when I grow up. And she has the cutest little China doll you've ever seen! Her Li Li is actually quite the model so she never gets a bad shot. I originally found Debbie's blog and kept checking in on her because of her awesome scrapbook pages. She's recently combined several of her blogs and it's all about their family, scrapping and photography! LOVE IT! I hope to take a photography workshop from Debbie in Feb. next year! Can't wait! 2. 3 Peanuts: I think Kim has gotten this award before, but I have to give it to her again because I LOVE her too! Landree and I actually got to meet Kim and her peanuts (and Dave too) in May. I saw a comment that Kim left on another blog and clicked on her name because of her profile picture of the Peanuts. Kate, adopted from China, and her boys are all so handsome I had to check them out. What else can I say? TONS of people read her blog. She's smart (former professor-actually I think she has her doctorate), a super mom who's always put together, she can even host sleepovers in the midst of a move, and they eat healthy (gluten free, wheat free, everything free :) How do you do it Kim? 3. Princess Pastimes: This is my real life friend Jennifer. I used to work with Jen's husband, Joe. I saw them at a wedding last year and we chatted about digital scrapbooking and my blog and then Jen started her own. I love that we can stay in touch with our blogs. She is expecting her third child in Feb. (their first boy). I love Jen! She's creative, a great mom to her girls, and she loves the Lord. It's obvious in everything she does. I love how her relationship with him flows out of her everyday conversation (and writing) I love keeping up with them and seeing pictures of their sassy, sweet girls! 4. Thinking Out Loud: Dino always has something challanging to say. He's just finished up an inteium teaching position at our church. He's done a wonderful job. He is an elder at our church, runner, and he's really smart. If you're up for a challange check him out. 5. Lisa Leonard: I first found Lisa's blog through her jewerly website. She makes the most beautiful things. Then I started reading her blog. I love ther pictures she takes and I check in on her almost everyday. Today she made the neatest scarf. I might try to make one too. 6. Flipflops and Applesauce: You're not seeing double. Chrissie and the above Lisa are twins. I found Chrissie's blog through Lisa's. Her site is all about family togetherness. She does fun crafts with her twin girls, shares recipes, and other great ideas. Chrissie even did a post on how to teach/help your kids learn/remember to set the table. She updates almost everyday if not more. I love to check in and see what new fun ideas she has come up with. 7. Nesting Place: The nester gives tons of great tips on how to decorate on a dime and she makes the cutest tassels and ragamuffin garland! I love it! And I love the tutorial she just did on how to jazz up your Christmas Garland. It looks like a million bucks! 8. Classy Chaos: I know this the 8th blog, but I have to tell you about Oh Mommy too. I love her. She writes like a story teller. Her blog is light, fun, and wonderful! She is a real mom with 3 young children who also happens to be doing a giveaway right now! Click here for your chance to win a cute pair of YOU boots. You have until Sunday, November 23rd. I could write something wonderful about everyone of the blogs I read. So in all your spare time online (ha!) check out everyone in my sidebar! I love your blog too Jen! How much do you charge for a blog makeover? You are so sweet Jen! Thank you for the kind words...I love your blog too:) Happy Thanksgiving! P.S. I don't think I have gotten this one before. Awwww... YOU made me blush out loud. Silly you! Many thanks. Thank you :D You are so sweet and I (heart) your blog too!